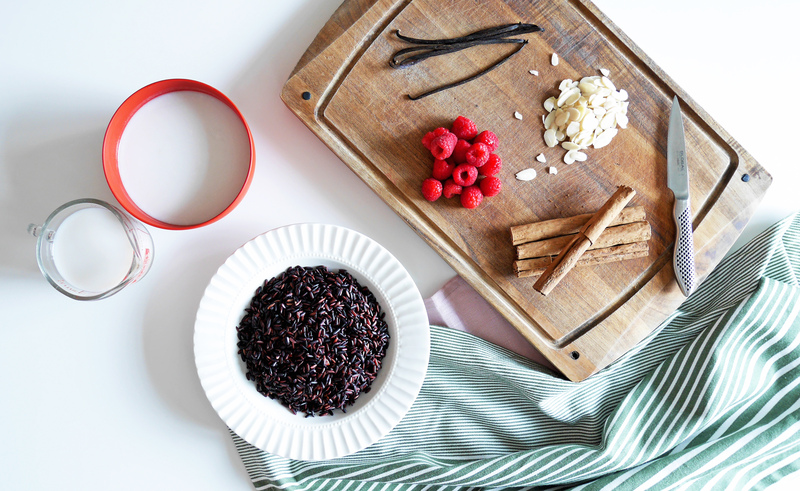 My inspiration for this recipe is an Indonesian black rice pudding, which was specially requested by my best friend a few weeks ago. She has such a sweet tooth, so it was not a surprise that she fell madly in love with the rich sweet rice pudding while her recent stay in Bali. Since I am also a fan of the dish myself I decided to give it a go, but with a little bit of twist. I know the traditional (or conventional) version of rice pudding is still incredible, but this seems to be too good an opportunity to miss out on adding my favorite spices and nutty flavors. I am also adding tangy raspberries, which I personally like to pair with rich flavored dessert, but tropical fruits such as mango, pineapple or banana will also work well with the pudding. This dessert is dairy-free and if you want a vegan version you can use agave nectar instead of honey. Soak the black rice overnight, about 8 hours. Rinse and place it in a pot with a cinnamon stick, sea salt, 1 ½ cup of water and coconut milk (3 cups of liquid in total). With a sharp pairing knife, halve the vanilla pod lengthwise and scrape the seeds. Set aside the vanilla pod for later use and add the seeds into the pot. If you are using vanilla extract instead add 1 teaspoon. Bring the rice to a boil and turn the heat down to low for gentle simmer. Cover and cook for 30-35 minutes stirring occasionally to make sure the rice doesn’t stick. Most of the liquid should have been absorbed at the end. When the rice has been cooking for 20-25 minutes, boil 1 cup of almond milk with a vanilla pod (or ½ teaspoon of vanilla extract), cloves and honey for 1 minute. Set it aside and let the spices infuse until the rice is cooked. Take out cloves and vanilla pod from the almond milk and pour it into the pot with cooked rice. Simmer in medium heat for 3-4 minutes mixing and stirring gently. 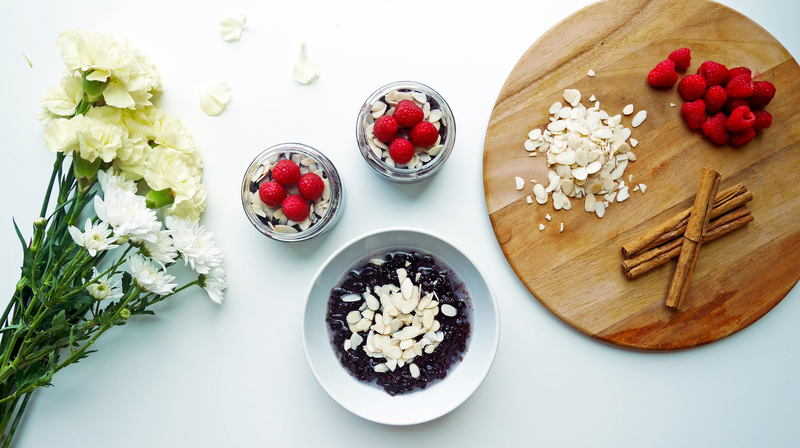 Plate the rice pudding with final garnish of coconut milk, almond flakes and raspberries. Thanks 😉 I am still thinking about your mouthwatering Yakitori here..!! This looks really, really beautiful and delicious! Saving this to try later!! Very interesting … mounth watering dish Too. Can I use white glutinous rice instead of black ? Thanks! I don’t see why not. Thai Mango sticky rice is often done with white glutinous rice. It should work just fine. Let me know how it goes. Wow, how interesting! 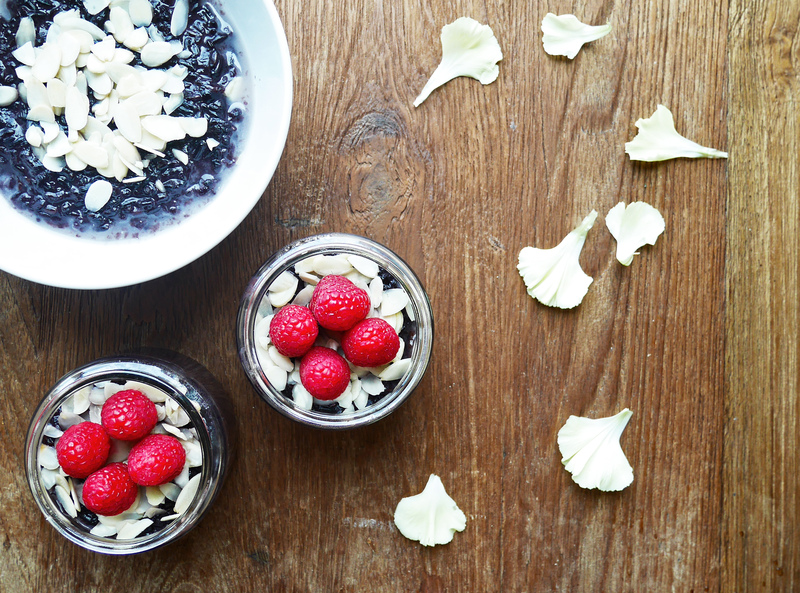 I’ve never seen black rice pudding before!